The filmmakers chosen by the Film Development Council of the Philippines to participate in the 1st Sineng Pambansa National Film Festival All-Masters Edition are: (from left) Gil Portes, Maryo J. de los Reyes, Romy Suzara, Joel Lamangan, Mel Chionglo, Lore Reyes, Peque Gallaga, Jun Urbano, and Tikoy Aguiluz. New obras from Philippine cinema’s most celebrated master directors make up this year’s Sineng Pambansa National Film Festival All-Masters Edition. The Film Development Council of the Philippines, in cooperation with SM Cinema, the largest cinema exhibitor chain in the country, will mount the Sineng Pambansa National Film Festival this September 2013. This film fest will unveil the latest master works from the country’s most accomplished and celebrated film directors—with respective bodies of work that have spanned decades to substantially form part of Philippine cinema heritage. Last February, the Film Development Council of the Philippines presented the veteran filmmakers who were invited to take part in the 1st All-Masters Edition of Sineng Pambansa. The chosen filmmakers were alloted a seed grant of 1.5 million pesos to create their dream projects. However, Jun Urbano backed out from the competion since the director encountered difficulties raising counterpart financing for his entry titled The Winged Gladiator. The remaining filmmakers are: Elwood Perez (Otso), Gil M. Portes (Isang Tag-araw ni Twinkle), Romy Suzara (Tinik), Maryo J. de los Reyes (Bamboo Flowers), Mel Chionglo (Lauriana), the directorial tandem of Peque Gallaga and Lore Reyes (Sonata), Tikoy Aguiluz (Eman), Chito Roño (Badil), Joel Lamangan (Lihis) and Jose Javier Reyes (Ano ang Kulay ng mga Nakalimutang Pangarap). 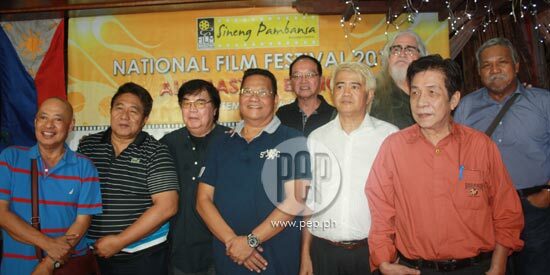 A grand reception to formally kick off Sineng Pambansa National Film Festival 2013 is slated on September 7 at the Atrium of SM Mall of Asia. Full selection of festival films will screen exclusively at SM cinemas in over 45 SM branches nationwide from September 11 to 17. In addition to the master directors’ entries comprising the main slate for this year’s Sineng Pambansa festival are some special features. A masters’ master tribute seeks to honor the memory of Celso Ad. Castillo with the showcase of the last film he directed, Bahay ng Lagim. New breed cinema is represented by the debut film from TM Malones, Salvi. A short film competition will have winners each from Luzon, Visayas and Mindanao. In addition, recently restored classics respectively from National Artists Lino Brocka and Manuel Conde, namely, Maynila sa mga Kuko ng Liwanag (1975) and Genghis Khan (1950), will also be screened for moviegoers.